Lieutenant-General Thomas Gage, commander-in-chief of forces in British North America, and other British officers who had fought in the French and Indian War, had found it hard to persuade colonial assemblies to pay for quartering and provisioning of troops on the march. The purpose of these laws was to take back hold of the colonies. Therefore, he asked Parliament to do something. Most colonies had supplied provisions during the war, but the issue was disputed in peacetime. The Province of New York was their headquarters, because the assembly had passed an Act to provide for the quartering of British regulars, but it expired on January 2, 1764, The result was the Quartering Act of 1765, which went far beyond what Gage had requested. No standing army had been kept in the colonies before the French and Indian War, so the colonies asked why a standing army was needed after the French had been defeated. 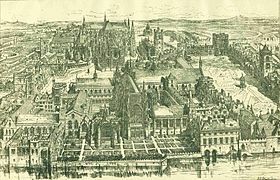 This first Quartering Act was given Royal Assent on May 3, 1765, and provided that Great Britain would house its soldiers in American barracks and public houses, as by the Mutiny Act of 1765, but if its soldiers outnumbered the housing available, would quarter them “in inns, livery stables, ale houses, victualing houses, and the houses of sellers of wine and houses of persons selling of rum, brandy, strong water, cider or metheglin”, and if numbers required in “uninhabited houses, outhouses, barns, or other buildings.” Colonial authorities were required to pay the cost of housing and feeding these troops. When 1,500 British troops arrived at New York City in 1766 the New York Provincial Assembly refused to comply with the Quartering Act and did not supply billeting for the troops. The troops had to remain on their ships. 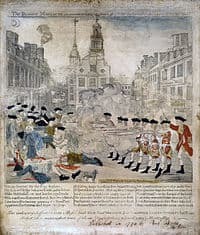 With its great impact on the city, a skirmish occurred in which one colonist was wounded following the Assembly’s refusal to provide quartering. For failure to comply with the Quartering Act, Parliament suspended the Province of New York’s Governor and legislature in 1767 and 1769, but never carried it out, since the Assembly soon agreed to contribute money toward the quartering of troops; the New York Assembly allocated funds for the quartering of British troops in 1771. The Quartering Act was circumvented in all colonies other than Pennsylvania. This Act expired on March 24, 1767.